I didn't start this book right off after I checked it out from the library. I had really wanted to in some ways but in others, I didn't. For one reason is the subject matter is tough which deals with eating disorders (anorexia, bulimia) and through my reading I found out that there are other subjects included (cutting, ghosts) that are tough to read about in this book also. This book is an emotional investment and even though I may not want to think about subjects like these, it is real. This book was written in such a way that it made you feel, even empithetically, what Lia, the main character, was thinking. My heart was torn and breaking for her and at the same time I wanted her to make sense of all of it and find a way to overcome. It left me to wonder about how I struggle with my own irrationality but I don't always notice the tiny opportunities or people given to me that could help me along my path. They are so small and tender that it is hard to see clearly sometimes. It finally takes sheer "will" and difficult "work" to change. I have to open my eyes and regard it as merciful. It amazes me that Anderson could stir all of this thought process within me by her writing. I find that is a wonderful talent for an author. I'm glad she has shared this with the world and I look forward to reading other works of hers. I can't say that I completely loved this book because it was not easy due to the subject matter to read but I do view that it is important. For some, it may even be helpful or at least that is my hope. I would recommend this very carefully. I wish I had finished reading this book in time to attend my library's book group discussion on it which would have been interesting. Check out these thoughts from the author at Amazon Videos. guppies, tetras, mollies, and angelfish. Sharks circle their prey. exit. Bits of fish flakes and strings of poop dangle in the air. "Beautiful when seen through the paper wings of out-of-season flies." i love the excerpts, Julie. especially the imagery in the cafeteria quote. Thanks, Hamilcar. I really like the imagery from that quote also. Here is another review of Wintergirls you may want to check out: Review found here. I love that book and thats very good review juie! another book by LHA I recommend is SPEAK. 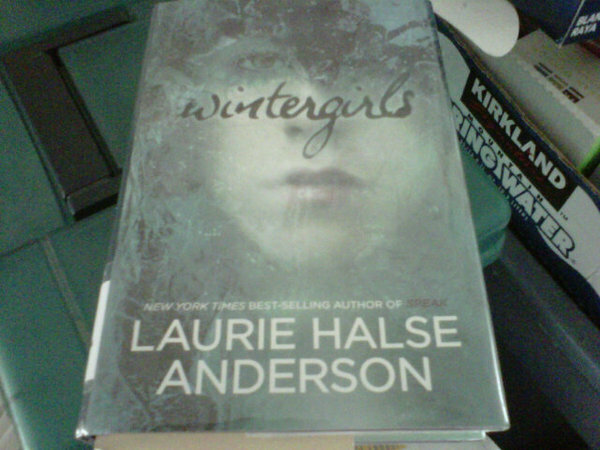 I loved this book, and LHA in general. I felt that this book was an incredibly powerful read, and definitely one of my best for 2010. I like the quotes you added, but I think my favorite quote, and the one I feel is most indicative of Lia and her mental/emotional state is when she is discussing that no matter what number shows up on the scale, it's never enough, that she won't be satisfied until it says zero. I don't remember the full quote, but I do remember that she says zero in tennis is love. I finally get it. but, I really enjoyed your review!